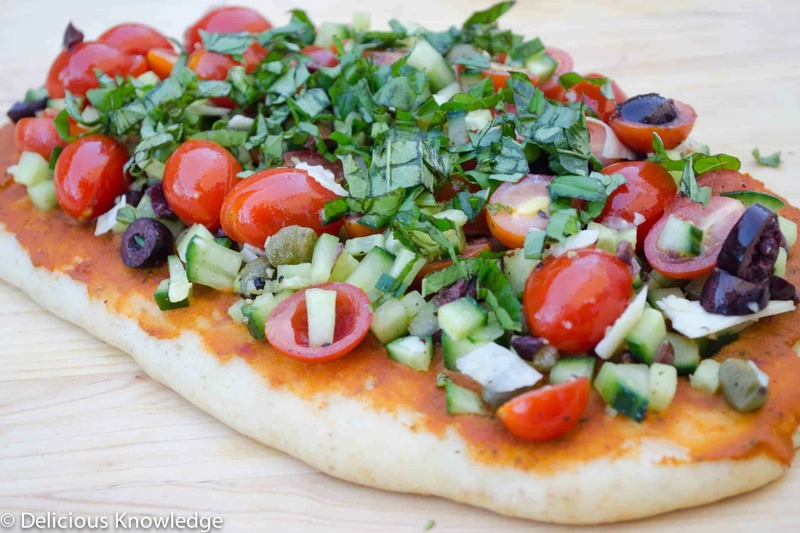 What distinguishes a pizza from a flat bread? The toppings? The shape of the crust? The accepted absence of cheese? To me, they are one and the same. Flatbread just sounds fancy, the type of handheld meal you enjoy with a glass of wine, pizza a more casual reference and usually topped with piles of cheese. In honor of National Vegan Pizza Day tomorrow (!) I present you with my Grilled Mediterranean Pizza flatbread. Proof that any holiday can be created and celebrated, who knew that National Vegan Pizza Day even existed? If you needed an excuse to enjoy this amazing meal, it’s here. And what kind of blogger would I be if I didn’t bring you a cheese-free favorite? Smoky, grilled crust, then topped with fresh tomato salad and creamy hummus. So good, so fresh, so clean. How are you celebrating National Vegan Pizza day? 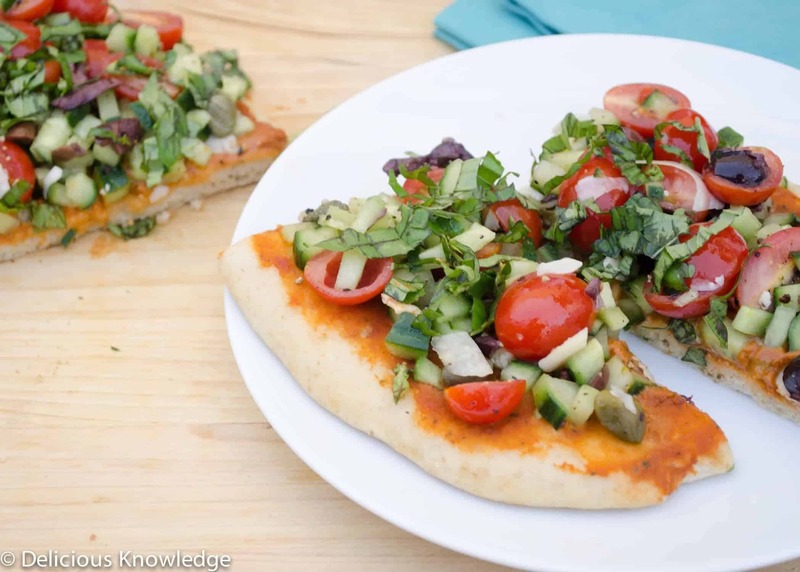 If you need more inspiration, check out Kristy’s roundup of vegan pizza favorites. 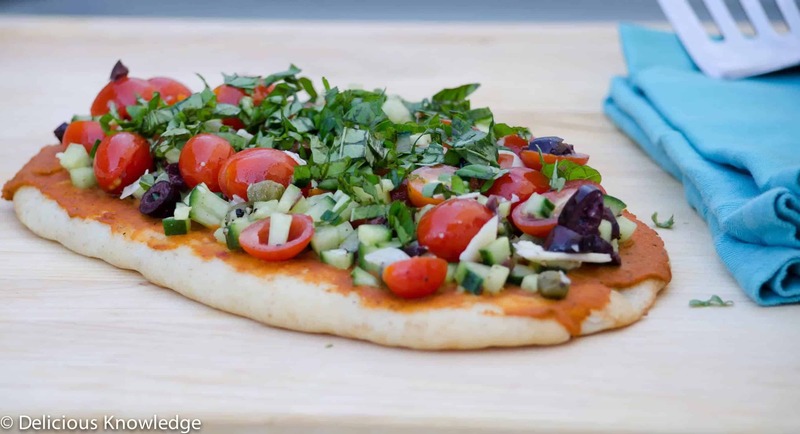 Grilled Mediterranean Flatbread, a healthy vegan pizza! 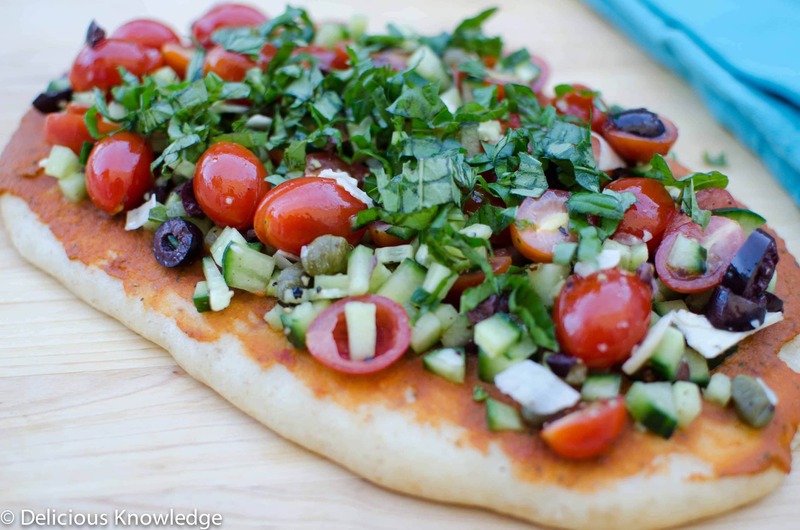 Grilled flatbread with tomato-basil hummus, olives, tomatoes, cucumbers, capers and lots of basil! Heat a grill pan or grill to medium-high heat. Lightly spray the flat bread with spray and place on the grill until warmed through on both sides. Spread tomato basil hummus on one side. In a large bowl, toss olives, cherry tomatoes, cucumber, capers with olive oil and salt/pepper. Scoop onto the flatbread and sprinkle basil on-top. I love grilled flatbread and this sounds absolutely delicious Alex. Happy Friday! I just know I am going to become a devoted fan. So delicious!!! Thanks Carolyn! Hope you like it!